It’s my birthday today. I’ve used that as an excuse for that fact that I haven’t blogged today. But what’s my excuse for the past week?! I’ve lost my blogging mojo recently and I think it’s because I’ve generally been feeling a bit down. I’ve had a couple of topics I’ve wanted to blog about but I’ve felt afraid to write as I think I’d just sound like a big whingebag. And no one wants to read about that! I’m feeling a bit more positive this week, though, so perhaps I can still write about those things with a slightly less negative slant. Predictably, one of the things I want to write about is to do with expressing. 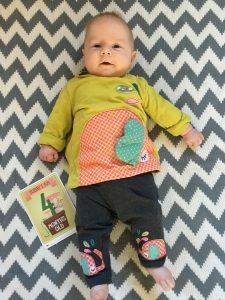 It was really getting me down this time last week but on Friday Little M turned four months old, another milestone on the long, winding, pumping road to being fully weaned! The other is to do with feeling isolated when on maternity leaving/being a stay at home parent. I think this needs a bit more thought before I write but in short, I didn’t leave the house for pretty much a whole week, and it was depressing. I needed a big kick up the bum, I know, as it was something of a vicious cycle. Anyway, I won’t run on about it now. As I said, today was my birthday and Little M and I had a lovely day together. We met a friend for brunch in one of my favourite cafes, which does decent gluten free food (always a winner) before heading to the local primary school for a Bounce and Rhyme session. I do love a sing song and it was lovely to see Little M enjoying it more than the last time we went (she was about seven weeks old at the time and slept all the way through!). I’ve tried to remember some of the songs so we can do them at home, too. Then I went to M&S and spent a small fortune on food for a lovely dinner tonight. My mum and dad came over and hubby came home earlier than usual with some lovely flowers, so I’m feeling thoroughly spoilt. I promise to try to pick up the blogging a little more this week! "Meet the Parents – Advice for New Mummies and Daddies from Belle du Brighton"
Dont bear yourself up. Being at hone can be lonelt and youl have days or weeks where u may feel a bit down we all do its normal. I find planning my week ahead ensures we dont have to many days indoors. Also if blogging abt topics like isolation makea u feel better then go for it whats the worse that can happen people may not read. Thanks. You’re right; it’s my blog, I can write what I want! I’m sure there are others who are feeling the same way. Oh Jules, a week without blogging is NOTHING. I’ve hardly blogged at all since Pickle was born – slowly trying to ramp it up now. Do NOT be hard on yourself. All this pumping is bloody hard work and you’re doing such an AMAZING job. You deserve to be so proud of yourself and the wonderful thing you’re doing for your baby. I don’t think I’d have persevered with it. You are incredible. And you’re so right – being in the house all week will definitely have you feeling in a slump. It’s quite nice to have a lazy day here and there but I think I’d go stir crazy if I didn’t get out regularly. I know it’s more difficult now the weather is turning but even just a walk down to the shops or something will do the world of good. Sending lots of love – and feel free to drop me a message on Twitter or anything if you ever need someone to rant to! I’m here. I’ve blogged twice this week but before that it was about 6 weeks ago! I’m just not always in the mood. Hope you had a fab birthday!